Knitting is a very satisfying pursuit for many people – it is a creative outlet that results in something that is both beautiful and functional. But knitting has many additional health and lifestyle benefits too. Here’s a look at how knitting can help you stay sharp. Aging can take a toll on the muscles, ligaments and bones of the hands. Knitting provides older hands an opportunity to stretch and move in ways that can improve both flexibility and pliability. 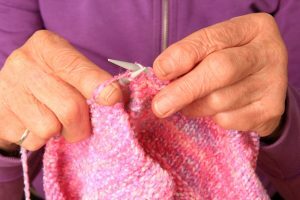 Conditions like arthritis can make certain tasks painful, but over time knitting can help ease the pain by keeping the fingers and hands supple and limber. Wrists can also be a particular pain point for people who suffer from arthritis, but lengthening and stretching these areas with the motions of knitting can often be helpful as well. Knitting is said to exercise both sides of the brain – the right side (creative) and left side (analytical). Because of this duality, knitting can be a helpful tool for cognitive anchoring, which is a process by which people are more successful in learning something new or retaining information if they are doing something with their hands at the same time. A study by the Mayo Clinic showed that pursuing activities such as knitting, quilting or reading in midlife in combination with other social activities cut the risk of developing memory loss in later years by more than one-third. Many older adults experience feelings of isolation or even depression as the result of reduced social interaction. Hearing or communication issues can make socializing particularly challenging. Joining a knitting circle may help combat feelings of isolation and help maintain and build new social connections. There are even a number of volunteer programs for knitters where time and knitting skills can be donated to teach others new skills. Many retired adults miss feeling productive. A results-oriented hobby such as knitting can give a tremendous boost for self-confidence and also provide a welcome sense of accomplishment once a knitting project is completed. For those who battle anxiety, knitting can have effects similar to those of mediation. Many knitters report that the motions and quiet sounds of the craft provide a soothing calm and takes them to a peaceful state of mind. In addition, since the repetitive motions of knitting utilize muscle memory, it’s that much easier to relax and enjoy the activity. At Lighthouse Senior Living, we’re committed to helping our residents lead full, rich lives. We offer a wide variety of events and activities, including several designed to spark creativity. Schedule a tour today to learn more about our supportive senior community.